To make qubits for quantum computers less susceptible to noise, the spin of an electron or some other particle is preferentially used. 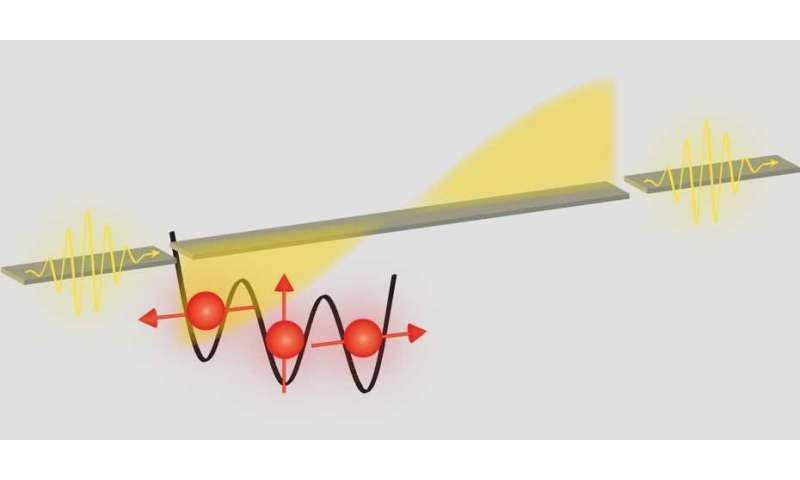 Researchers at ETH Zurich have now developed a method that makes it possible to couple such a spin qubit strongly to microwave photons. Quantum computers use quantum bits or "qubits" to do their calculations – quantum states, that is, of atoms or electrons that can take on the logical values "0" and "1" at the same time. In order to wire up many such qubits to make a powerful quantum computer, one needs to couple them to each other over distances of millimetres or even several metres. One way of achieving this is by exploiting the charge displacement caused by an electromagnetic wave, which is the working principle of an antenna. Such a coupling, however, also exposes the qubit to disturbances due to unwanted electric fields, which severely limits the quality of the logical qubit operations. A team of scientists working in several research groups at ETH Zurich, assisted by theoretical physicists at Sherbrooke University in Canada, have now demonstrated how this problem can be avoided. To do so, they found a way to couple a microwave photon to a spin qubit in a quantum dot. In quantum dots, electrons are first trapped in semiconductor structures measuring just a few nanometres that are cooled to less than one degree above the absolute zero of the temperature scale. The logical values 0 and 1 can now be realized in two different ways. One either defines a qubit in terms of the position of the electron on the right or left side of a double quantum dot, or else by the spin of the electron, which can point up or down. The first case is called a charge qubit, which couples strongly to electromagnetic waves through the displacement of electric charge. A spin qubit, on the other hand, can be visualized as a tiny compass needle that points up or down. Much like a compass needle, a spin is also magnetic and, therefore, does not couple to electric but rather to magnetic fields. 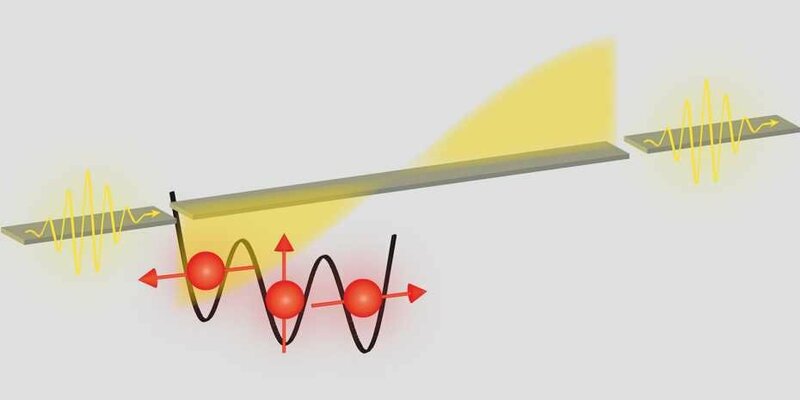 The coupling of a spin qubit to the magnetic part of electromagnetic waves, however, is much weaker than that of a charge qubit to the electric part. This means that, on the one hand, a spin qubit is less susceptible to noise and keeps its coherence (on which the action of a quantum computer is based) for a longer period of time. On the other hand, it is considerably more difficult to couple spin qubits to each other over long distances using photons. The research group of ETH professor Klaus Ensslin uses a trick to make such a coupling possible nevertheless, as the post-doc Jonne Koski explains: "By realising the qubit with not just a single spin, but rather three of them, we can combine the advantages of a spin qubit with those of a charge qubit." In practice, this is done by producing three quantum dots on a semiconductor chip that are close to each other and can be controlled by voltages that are applied through tiny wires. In each of the quantum dots, electrons with spins pointing up or down can be trapped. Additionally, one of the wires connects the spin trio to a microwave resonator. The voltages at the quantum dots are now adjusted in order to have a single electron in each quantum dot, with the spins of two of the electrons pointing in the same direction and the third spin pointing in the opposite direction. According to the rules of quantum mechanics, the electrons can also tunnel back and forth between the quantum dots with a certain probability. This means that two of the three electrons can temporarily happen to be in the same quantum dot, with one quantum dot remaining empty. In this constellation the electric charge is now unevenly distributed. This charge displacement, in turn, gives rise to an electric dipole that can couple strongly to the electric field of a microwave photon. The scientists at ETH were able to clearly detect the strong coupling by measuring the resonance frequency of the microwave resonator. They observed how the resonance of the resonator split into two because of the coupling to the spin trio. From that data they could infer that the coherence of the spin qubit remained intact for more than 10 nanoseconds. The researchers are confident that it will soon be possible to realize a communication channel for quantum information between two spin qubits using this technology. "This will require us to put spin trios on either end of the microwave resonator and to show that the qubits are then coupled to each other through a microwave photon", says Andreas Landig, first author of the article and Ph.D. student in Ensslin's group. This would be an important step towards a network of spatially distributed spin qubits. The researchers also emphasize that their method is very versatile and can straightforwardly be applied to other materials such as graphene.